Taunton, 6 vs. Bristol Plymouth, 7 – Final (OT) – Taunton rallied from a 6-1 deficit in the fourth quarter in its first ever varsity game but fell to BP in overtime. Lee Gobin scored a pair of goals for Taunton while Andrew Wellington, Jason Stern, Griffin Speicher and Cam Welby each scored once. Ryan Williams made six saves in net. Franklin, 14 @ Needham, 15 – Final (2OT) – Seven different players found the back of the net in Franklin’s opening game. Kenzie Pleshaw led the way with a team-high four goals and Emily Spath netted three goals. Sam Jones forced three turnovers on defense and had a pair of ground balls. Dani Lonati made seven saves in net. Taunton, 17 vs. Bristol Plymouth, 1 – Final – The Tigers picked up a win in the program’s first ever varsity game. Layne Kingman led the way for Taunton with three goals and three assists. Delaney Powell scored five goals, Abby Kingman and Hannah Moniz each had two goals and an assist and Breanna Conlon and Kayla Phillips each scored a pair of goals. Taunton, 3 vs. Durfee, 2 – Final – Brett Beaulieu picked up a marathon win at first singles (6-4, 5-7, 6-4), Mike Briggs won at a third singles (4-6, 6-1, 6-4) and Connor Briggs and Charlie Fiske teamed up for a 6-4, 6-1 win at first doubles. Taunton, 5 @ Durfee, 0 – Final – Jordan Pagliuca picked up a win at first singles (6-1, 6-2), Olivia Sweeney won at second singles (6-1, 6-0) and Delaney DeAvila rallied for a win at third singles (4-6, 6-2, 7-6). In doubles play, Emily Moor and Ashleigh Eason had a sweep at first doubles (6-0, 6-0) and Caroline Herbert and Jillian Pagliuca teamed up for a 6-1, 6-2 win at second doubles. Taunton, 3 vs. Norwood, 0 – Final – The Tigers opened the season with a 3-0 sweep over Norwood, 25-11, 25-21, 25-16. Sophomore Lance Law led the way with 14 kills, 10 digs and three aces while Ricardo DaFonseca picked up right where he left off last year, notching 24 assists. Lens Esquil had five kills and a block, Malik Charles added four kills, three aces and a block and Nate Grant had four kills, and ace and a strong game at the net. Head coach Toby Chaperon praised the work of David Perry and Dawid Fusiecki during the game. TAUNTON, Mass. – For the second straight Hockomock League game, an opponent that Canton once may have breezed past gave the Bulldogs a run for their money. But for the second straight game, the Bulldogs clawed out a narrow victory, edging Taunton 3-1 on Saturday. After a scoreless first period, Mike Dadasis put Canton on the board early in the second. 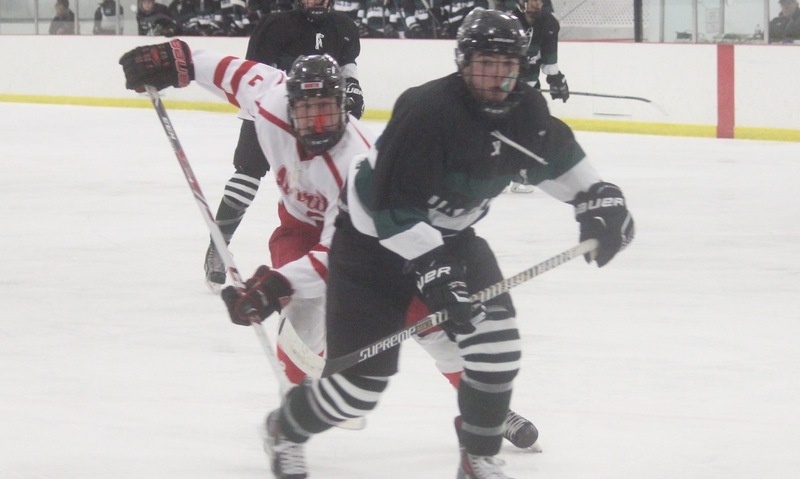 Dadasis redirected a pass from Jackson Maffeo in the right circle past Taunton freshman goaltender Griffin Speicher. Taunton answered quickly, though, as Will Walsh ripped a wrist shot from the right side over the shoulder of Canton goalie Justin Slocum on a two-on-one rush with Tyler Pietrzyk. But just as quickly, Seamus Pecararo buried his own rebound on the doorstep to restore the Bulldogs’ lead at 2-1. The eventual game-winning goal was Pecararo’s fourth tally of the season. Early in the third period, Matt Lazaro added some insurance for Canton, netting his fourth of the year after finding the puck on his tape in the crease. Taunton put some pressure on Slocum and the Bulldogs with an extra attacker in the final minute, but the senior goaltender preserved the win. Taunton played a hard, physical game, preventing the Bulldogs from the time and space that they thrive on, and Shuman had high praise for the Tigers. Speicher, who had won his two prior starts this season but allowed eight goals combined, stopped 35 of the 38 Canton shots he saw but suffered his first loss of the year. Metea was also pleased with the effort of the skaters in front of Speicher, keeping pace with one of the top teams in the league. Canton improves to 6-1-1 overall, 3-0-0 in the league, and will travel to Stoughton on Tuesday at 7:30. Taunton, now 7-3 overall and 1-2 in the league, will be off until Wednesday when it hosts King Philip at 6:00.